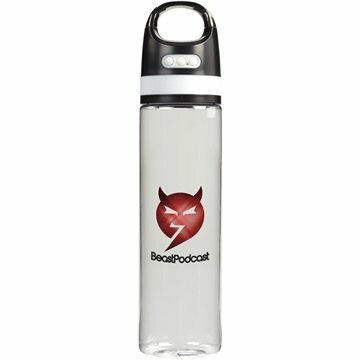 The Ozzy Light Up Logo BPA Free Audio Bottle 25oz lets you connect wirelessly to any Bluetooth enabled audio device and enjoy your favorite music, podcast or audiobook. It supports conference calls as well for easy, hands-free operation. Screw-on lid with a built-in, light-up, Bluetooth speaker complete with flashing LED lights to provide hours of on-the-go entertainment. Max 4 hrs operating time. Durable Tritan material is shatter, stain, and odor resistant. It also has a perfect opening for ice cubes and a wide mouth opening for easy cleaning and filling. This piece is also an exclusive item and is BPA free.